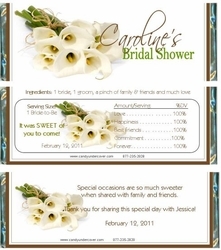 Our beautiful Calla Lily Candy Bar Wrapper design is just so pretty! A bouquet of Calla Lilies wrapped up in chocolate would put a smile on anyone's face. Perfect for Bridal Showers, Weddings and more. Chocolate is the SWEETEST favor and is sure to be a hit at your party!